The ultra far-right party won 11% of Sunday’s vote and will enter the regional parliament for the first time. This will be the first time in decades that an ultra-right party obtains seats in a Spanish parliament, whether national or regional. 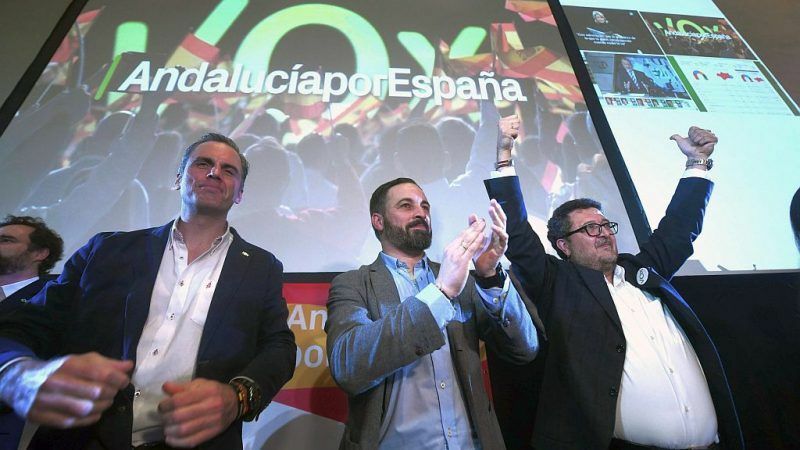 The centrist PP, rightist Ciudadanos and ultra-rightist Vox could now form an absolute majority in the regional parliament with 59 of the 109 total seats, in a major setback for the Socialist PSOE, who have governed in Andalusia since the country’s regional autonomy arrangement was established in 1982. The reversal in one of PSOE strongholds will also upset the minority national government in Madrid, led by the Socialists. In addition, it marks the resurgence of the ultra-right in a country that had so far managed to keep ultra-rightist and xenophobic parties on the margins, whereas such parties had already entered parliaments in other key European nations such as Germany, France, Italy, Sweden and Holland in recent years. “Democrats should work to form a constitutionalist and pro-Europe government. As the party with the most votes, we have the responsibility of leading this process to not allow the far-right to set the future course of Andalusia,” PSOE leader and Spain’s Minister of Development Jose Luis Abalos Meco told a press conference after the election results. The PSOE remained the single-largest party in the state with 33 seats, with 27.99% of the votes. Popular Party secured 26 seats with 20.76% of the votes, followed by Ciudadanos with 21 seats (18.26%). “Europe has clear red-lines against the far-right. Facing this threat, we are committed to democracy and the constitution and would like to restore the consensus and agreements established in our Magna Carta,” Abalos said. The Adelante Andalucia coalition, formed by the left-wing Podemos and United Left-Greens and other leftist parties, won 17 seats with 16.17%. The anti-immigration Vox will enter the regional parliament for the first time after obtaining around 11% of the vote. The national PSOE government of Prime Minister Pedro Sanchez came to power when the former prime minister, conservative PP leader Mariano Rajoy, was ousted in June after losing a vote of no confidence tabled by the Socialist leader. The vote was triggered when Rajoy’s Popular Party was found guilty of corruption in a court verdict. The voting in Andalusia opens Spain’s electoral season, which will continue with European and further regional elections due in May. There is also a possibility that general elections in Spain might need to be held early next year if Sanchez’s minority government fails to get the 2019 budget through parliament. No doubt that Vox poses a threat… to the Marxist plan to turn Europe into an Islamic extension of Africa.